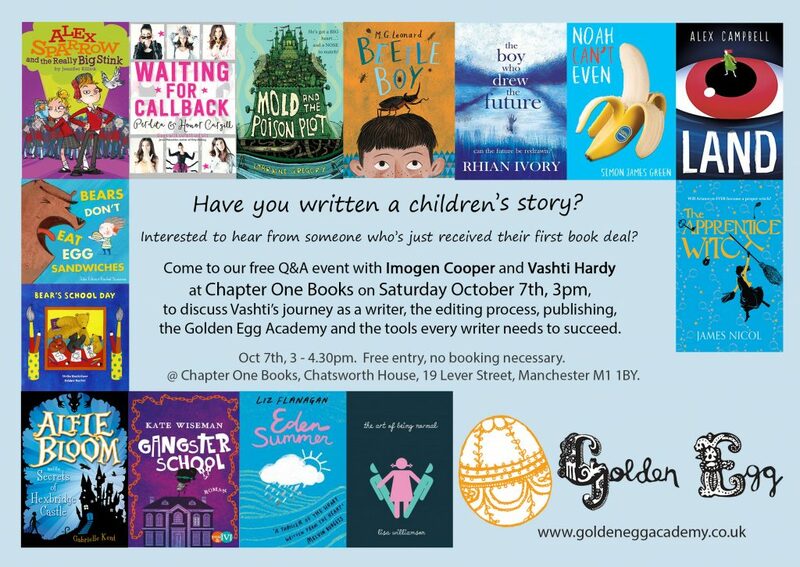 The Golden Egg Academy, which runs workshops, courses and mentoring schemes for children’s & YA writers, is spreading its wings north, with its first regional branch starting up in Manchester in 2018. The Golden Egg Academy North will be headed up by freelance children’s editor Tilda Johnson – formerly Senior Commissioning Editor for Hot Key Books and Piccadilly Press ­– and will run workshops in Manchester and offer mentoring sessions locally. Having started out on Imogen’s kitchen table, GEA will celebrate its five-year anniversary in 2018, having secured agents and publishing deals for almost thirty of its students, and enjoyed notable success with novels including Lisa Williamson’s THE ART OF BEING NORMAL, M G Leonard’s BEETLE BOY, Liz Flanagan’s EDEN SUMMER, Simon James Green’s NOAH CAN’T EVEN, James Nicol’s THE APPRENTICE WITCH and Lorraine Gregory’s MOLD AND THE POISON PLOT. Submissions for GEA North are now open via the Golden Egg website. Imogen Cooper – former Editorial Director at Chicken House, winner of the Branford Boase Award and Bookseller Rising Star 2016 – founded the company in 2013, after realising that both agents and publishers had less and less time available to nurture debut writers. As part of the submissions call for GEA North, Tilda will host a Q&A with GEA founder Imogen Cooper and GEA student Vashti Hardy in Manchester in early October. The discussion will look at Vashti’s journey as a writer as well as editing, children’s publishing, networking and the tools every writer needs to succeed. Vashti Hardy completed a writing MA at Chichester University before joining the Golden Egg Academy, being taken on by Kate Shaw of the Viney Agency and recently receiving her first publishing deal, for a skyship adventure story for middle-grade readers. The free, public event will take place at Chapter One Books, 19 Lever Street, Manchester M1 1BY at 3pm on Saturday 7th October.